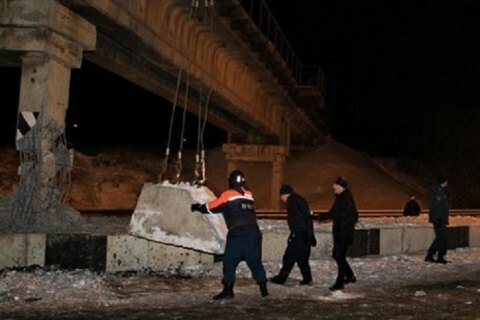 A railway bridge crossing the Slovyansk-Donetsk-Mariupol motorway in occupied Donetsk was damaged by a blast on 1 January, according to Russian and separatist media. "Unknown individuals blew up the central reinforced concrete pillar of the railway bridge over the motorway ring Slovyansk-Donetsk-Mariupol in Donetsk's Proletarskyy district in the Chumakove-Laryne sector, 27 km, on 1 January 2019. There were no casualties or fatalities," the so-called emergencies ministry of Donetsk separatists said. There is no traffic along or under the bridge.